Whether you're a high flyer or you just like pulling some strings, you're going to love The Brisbane Kite Festival. This family friendly event will be lifting off from 10am on Sunday the 18th of October at the Murrarie Recreation Grounds. 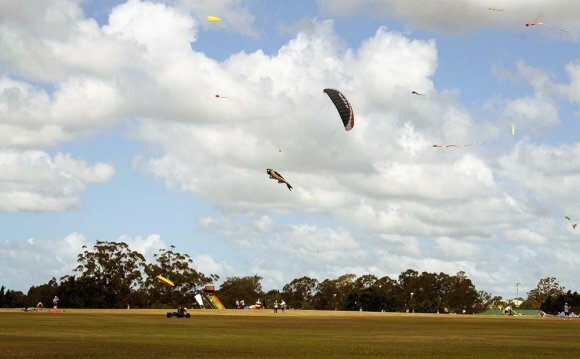 It's free to attend this fantastical day of flight that features the "the most spectacular kites ever seen over the skies of Brisbane" according to organisers, Rotary Clubs of Port of Brisbane. If you're so inclined, you can make a gold coin donation to Rotary on entry. You're also welcome to bring along your own kite and join the fun of seeing it soar. The organisers say, "We have a designated area for the public to fly their kites alongside professional kite flyers. Bring your own kite or purchase one from the festival! All of the kites available are relatively easy to put together and fly, however if you need help, don't panic. Our professional kite flyers will be happy to help you get airborne." There'll be plenty to see on the ground too, with food and market stalls, kite workshops, and lots of entertainment on offer. The kids are sure to love the face painting, jumping castles, and other thrilling rides. Those who love their food will be glad to hear there'll be burgers, sausage sizzle, and more available all day. All proceeds from donations and stalls will be used for local and international community projects of the Rotary Clubs of Port of Brisbane, Carindale, and Balmoral. If you'd like to be a stallholder on the day, now's the time to get in touch with the organisers via their website. Why? Let's go fly a kite!